Though Afro Celt Sound System have been working for over seven years after coming together at a Real World recording week, the first time they really came to my attention was when my wife and daughter returned from a trip to Seattle in 2001 raving about this band they'd heard play at the Womad festival. They were so impressed that they bought all the band's albums, so I got indoctrinated by default! The band have recently shortened their name to Afro Celts (which is what their fans seem to call them anyway), but it's not easy to categorise their style as they combine elements of contemporary dance music with vibrant West African rhythms, traditional Irish melodies and instruments and other world influences. Their latest album, Seed, has seen 'real' playing come to the forefront, so although the band still make extensive use of loops, sampling, synthesis, creative editing and all the other techniques of modern production, they increasingly value human performance as the most important element of all. Seed features Simon Emmerson on guitars, bazouki, mandolin and Akai MPC3000, James McNally on keyboards, piano, bodhran, whistles and bamboo flute, Iarla O Lionaird on vocals, Martin Russell on keyboards, N'Faly Kouyate on vocals, kora and balafon. Myrdhin plays Celtic harp, Moussa Sissokho talking drum and djembe, while Johnny Kalsi plays dhol drum and tablas, Mass takes care of the drum and synth programming and Emer Mayock plays Uilleann pipes and flute. Afro Celts have their own studio in the Britannia Row premises originally home to Pink Floyd's private studio. Their working method is far from traditional: the band actually have three producers in James McNally, Simon Emmerson and Martin Russell, and anything that doesn't satisfy all of them goes back onto the shelf to be reworked or discarded. "All three of us involved in production have to be sure the music has hit the nail on the head," insists James. "It has to please three very different people, but when disagreements do occur, it's invariably to the benefit of the music." It seems that James tends to start the creative ball rolling, as well as defining the melodies and chordal parts. He also plays traditional Irish instruments — low and high whistles, accordion and bodhran, which has been a key element in the driving rhythm of the band since their debut album Volume 1: Sound Magic, recorded in 1995. Prior to this, James, who was classically trained and an all-Ireland champion on piano, played in many different bands including the Pogues, radical hip-hop act Marxman and Storm. In addition to being a solo recording artist he also has played keyboards for Peter Gabriel and recently wrote two songs with Ronan Keating for his forthcoming album. 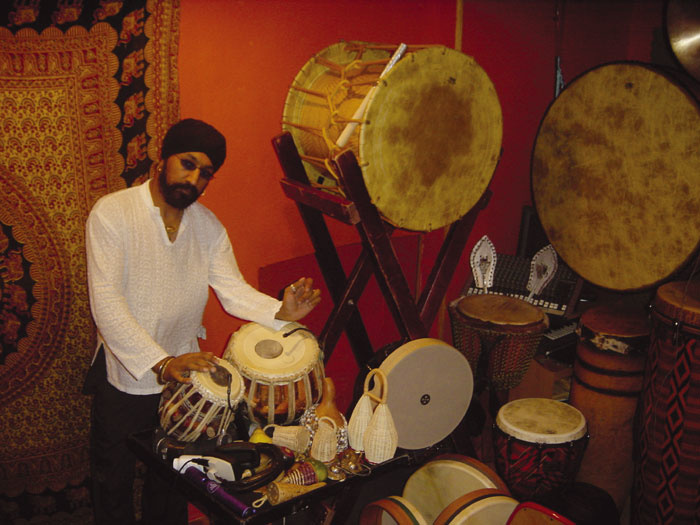 To hear his bodhran playing alongside Johnny Kalsi's drumming is an education in rhythmic symbiosis, but in most instances, the band use several different drummers, blending ethnic drum sounds with more traditional kit-like programming. Simon Emmerson, formerly a member of Working Week, plays guitars for the band as well as producing, and is cited as one of the founders of the Acid Jazz movement. The first two Afro Celts records were programmed and sequenced by Martin and Simon on Akai MPC60 and 3000 drum machines and C-lab's Atari sequencers, with audio provided by Akai samplers, ADATs and a SADiE hard disk recording system. 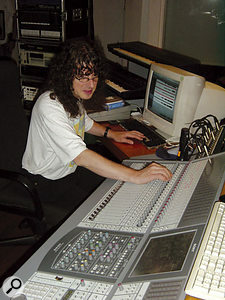 By Volume 3, most of the drum programming work had been handed over to Mass, which allowed Simon to concentrate on his guitar playing — around the time of Volume 3 he was encouraged by the band to get himself a set of mandolins, bouzoukis and citterns, providing the multi-layered guitar texture that's central to the Afro Celt sound ("I've also invested a lot in new instruments, including the Stapletone, a little cello-built guitar, and when you get a different sound you tend to play differently," he explains). He's recently invested in a range of Line 6 products, which he was keen to talk about. Simon: "I came across Line 6 while looking for some MIDI-friendly vintage delays and guitar effects. Both the Line 6 Echo Pro and various Pod boxes feature heavily in my studio sound. The Vetta amp gives me an almost unlimited range of stereo cabs and guitar amps, delays and distortion stomp boxes all modelled into one setup. The amp is used with the FBV foot controller so I can recall all my settings, ranging from acoustic amp presets for my citterns and acoustic guitars through to a full-on electric sound. For electric guitars I use mainly a Line 6 Variax sound-modelling guitar plus a vintage Telecaster, tuned to an open 'F' chord for bottleneck work." Martin Russell.Martin Russell, once a member of the Enid, has been the band's recording and front-of-house engineer since the beginning and is also a writer and keyboard player. 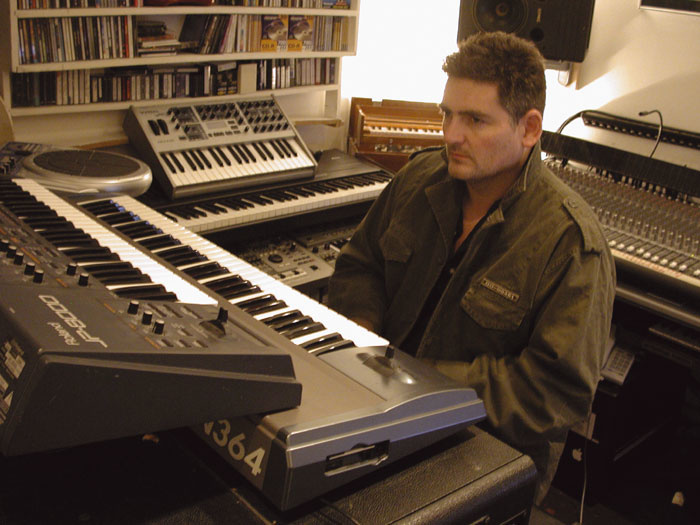 He's worked in a number of prominent London studios, doing both technical and sound engineering, eventually going freelance, building his own studio and, with Simon, co-producing albums for Real World and other world music labels. 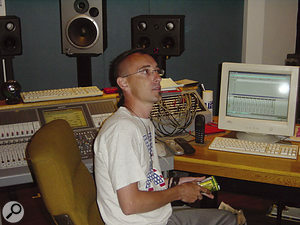 He almost single-handedly designed and converted the shell of the former Britannia Row recording space into a working studio which is organised into several different physical zones interconnected by both analogue and digital tie-lines, making it easy to record in any part of the studio and to exchange audio components of any work in progress. "Every area of the studio is connected so although we each all have our separate work areas, we can bring all the elements together and can use any area for any purpose," he explains. "Over the past two albums, we've worked on a lot more tracks simultaneously and when we come to mix, Mass and I run our two Logic systems and the Sony DMX R100 digital mixing console, laying off in-sync 24-bit mixes onto SADiE. Tracks are often being restructured right into the mixing stage. The main Afro Celts studio is based around a Sony DMX R100 digital desk, with a Quested surround monitor system. 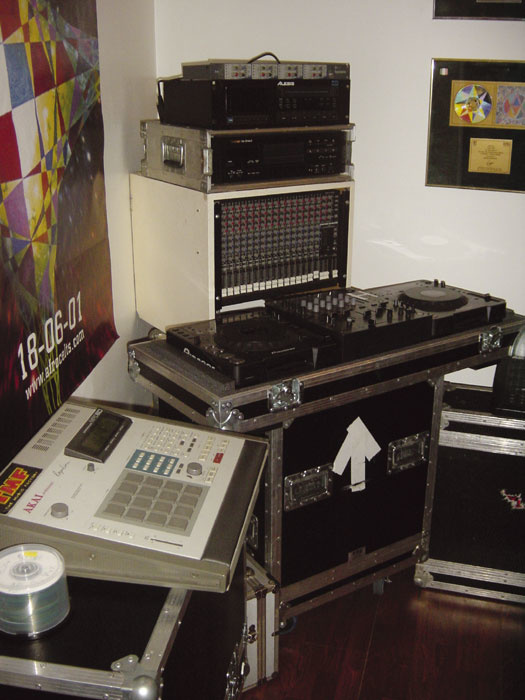 "We initially bought the Sony DMX R100 desk to use as a live monitor board, on the Further In Time tour, so we could recall snapshot mixes quickly to feed multiple in-ear systems, but I realised that the Sony could do 5.1 surround sound straight out of the box so I started to make drawings and configuration plans for a surround-based studio. Now we have one desk for live and another permanently in the studio." 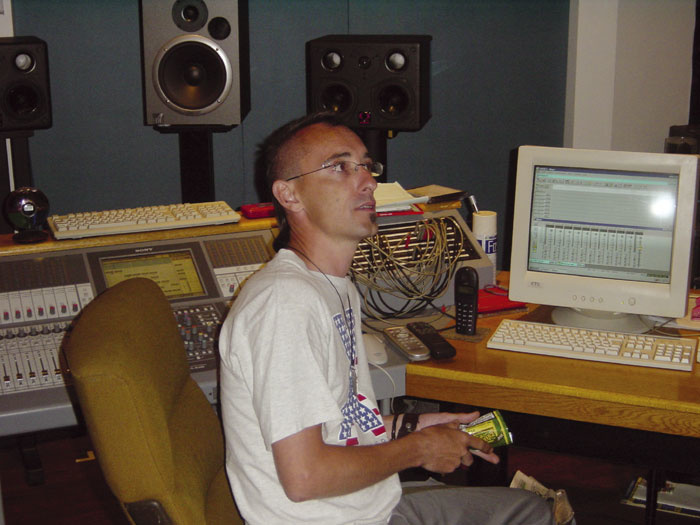 Mass.Remix specialist and engineer Mass was brought into the project at the start of Volume 3: Further In Time and has taken on an ever-increasing role in Afro Celts recording work. 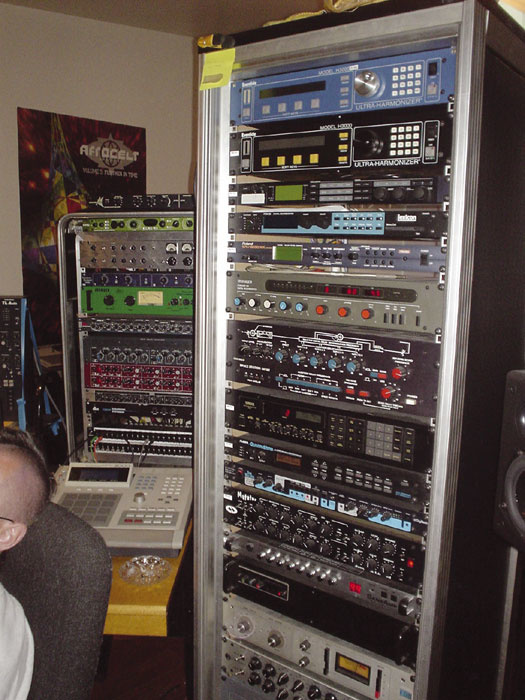 He has his own mobile production area within the studio where a G4 Logic rig, synths and samplers sit alongside more traditional analogue outboard processing. The band are hoping that his contributions will become permanent, in which case there will be four producers to satisfy! "It is unusual having three — or four, now Mass is with us — producers working on the same music, and things are made more interesting by the fact that we all have different recording systems," says James. "I'm a Pro Tools/Mac person, Martin is a PC SADiE and Mac Logic guy, while Mass is a Mac Logic user. Simon is an MPC and ADAT man, so at the beginning we thought we'd got problems, but Martin was adept at sync'ing everything up, and now we've got to know and love each other's differences." 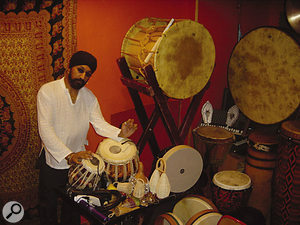 Johnny Kalsi, playing the tabla.Martin and Mass divide engineering and editing duties between them, jointly mixing the results in the studio. Before we get down to serious questioning, James gave me a tour of the facility starting with the basement room, generally Mass's area, but currently more than half filled with Johnny Kalsi's and James's exotic drum collection. "Johnny features on dhols and tablas, as well as some huge African and Japanese drums," explains James. "He's a master drummer from the Dhol Foundation with an album out on the Narada label, and we've worked with him now for three albums. "From Volume 2: Release onwards we progressed from combining just African and Celtic percussive styles to bringing in Asian influences. The dhol and the tablas have become very important alongside the talking drum and the bodhran. The subtlety came in with the tablas while the percussive power came with the dhol drum and djembe. Sometimes our tunes are seven minutes long and they start off fairly strongly, so you have to have somewhere to go after that! Interestingly, though, some of the smallest things can be used to create the most powerful elements, such as the resonant ping of the bottom of a metal tabla. "I think that one of the main reasons for this working so successfully is that once we've recorded all this stuff, Mass and Martin are absolutely amazing programmers and they have a real skill in incorporating what I call 'the real deal' — acoustic instruments — with technology. For example, on the album Further In Time, on track nine, there's a beautiful pipe air, but that part was never played as an air originally. It was made up from ad lib phrases that pipes legend Liam O'Flynn had played inbetween Iarla's singing. I could hear the melody of the air we wanted to create from all these improvised phrases, but without Martin's editing skills it would not have sounded any where near the credible performance piece it needed to be." For drum recording purposes, both the basement and the studio itself are used, as James explains. "As a rule we get a better sound in the studio with the bigger drums as they need space for the sound to develop, but the smaller drums, in particularly the tablas, sound fantastic recorded in this room. Martin is the main recording engineer so it depends on what he feels will work best, but we have recorded drums everywhere, in the hall and even the stairwell. When we are recording several drum parts at once, we'll use several rooms at the same time to keep the sounds isolated. In the last place we even recorded in the kitchen. I feel it's also important to capture the initial acoustic ambience of a drum being played rather than just adding reverb afterwards. It makes all the difference." Martin explains that when they moved into their space at Britannia Row it had been stripped out to the walls and had previously been used as a photographic studio. Martin used to be technical director at Swanyard Studios and was used to building things from scratch, so he set about fixing up Brit Row so that it could once again function as a studio. "The acoustic treatment comprises a lot of Revac (dead-sheet) and industrial underlay, but we still need to calm the wooden floor down and deal with the corners of the room, as it tends to go off a bit at the bottom end when we turn the levels up. When we took our first test mixes to Ian Cooper's mastering room at Metropolis, we found there was no bass because we'd filtered it all out! "I went straight from building the studio to completing and mixing the album, with no recovery time. It was a new configuration, new monitoring, new automation — a lot to assimilate as we went along. However, I'd done a lot of listening, testing and checking during the build, and once you get used to something, it becomes like your instrument and you acquire an instinct about 'playing' it. When we'd got used to the room, the mixes came out a lot better and there wasn't too much to do to Seed when it was mastered. If you do have to do a lot at the mastering stage, then it's usually an indication that you haven't done a good enough mix." It's James who usually provides the seed for most Afro Celts compositions: "I'll get a collection of basic ideas going in my area, using samples, loops or whatever, then I'll pass them on to the drummers to see what they add. What I'm looking for are those moments of magic when everything works together, then we can cherry-pick the best pieces, after which Martin and Mass compile, edit and loop them. Sometimes those sections of magic last five or six minutes, in which case you end up having to leave amazing things out. Often we'll end up with several layers of different drums, but because we try to keep them all as separate as possible, we can select which elements work." Some of the band's array of ethnic drums and percussion. Martin adds: "I call these type of sessions 'trawl net' recordings — you never know what we're going to get, but you can guarantee that there'll be loads of interesting fish to examine!" Mass explains that Logic's Colour Objects function is used to colour-code the material using the colours of cold through to hot, representing the takes where the magic happened. James is at pains to point out that Martin and Mass's work is an equally creative part of the process: "Programming is certainly not all a technical experience, because just as a drummer pours his soul into the playing, I think that Martin and Mass do the same when they're working. The grooves and ideas that they work on and then throw back to me have been reinterpreted by them so they had a creative part in their development." So, do they always begin with rhythm parts? "Not always," says James. "Sometimes we'll work from the top down, starting with just a simple song or a top-line tune, then we'd write the track underneath it, but for the past two albums, I'd say that's the exception rather than the rule. Then the process goes on — we add keyboards, there are multiple swirling guitar parts, the kora comes in and all these layers get developed. Johnny describes the music as being like a tapestry — on some of the parts he might only be doing two hits in eight bars, but the placement of those hits is crucial. "After the initial stages, I go on to develop melody and harmony using the piano/keyboards, accordions, harmoniums, rhythm boxes and effects. If I hear a particular tune or top-line vocal I will play or sing it directly into Pro Tools. I'm not really in the business of refining anything at this point as I hate stopping to adjust things technically, so I usually just keep the recorders rolling. I write nearly all the top-line tunes, especially the Irish ones. Everything to do with guitars and similar stringed instruments is Simon's world and he builds a very different structure to me — a very English top line as opposed to my Irish top line. Then N'Faly will come in with his African melodies, and putting these together is where the real work is. "I think one of our strengths is to make all these melodies and counter-melodies sit with each other. Martin will often take my tunes and manipulate them into something broader by, for example, chopping my melodies up into phrases, then reordering them to produce something that I might never have thought of. In fact, to Mass and Martin's credit, they do a great job in not allowing the mixes to become saturated, because with a band like us, there are so many things that it could end up being too much." "Originally we'd record everything in 16-bit on the SADiE, in sync with the Atari or the MPC," says Martin, "so in those instances where we've taken pieces from earlier recordings, we've often ended up with 16-bit parts sitting next to newly recorded 24-bit parts. I started out working with Notator on an Atari and the audio came from multiple samplers, so I got used to the way of working where you recorded things, chopped them into 'chicken nuggets', digitally transferred them, then triggered them from the samplers. We worked this way for quite a while and the samplers in effect became more outputs for the SADiE stuff. It could be quite painstaking, particularly when the original placing and intention needed recreating exactly. In those days hard disks were smaller and way more expensive, so there wasn't the option to retain everything on disk as you needed the space again to do further recording! "I did most of the recording for Volume 1: Sound Magic in 1995 on a 2GB drive which was the size of a house brick. Then in 2000 I saw Mass with his Logic system! I was very much a dyed-in-the wool PC person, but I decided that Logic on a Mac would complement the SADiE system, which was struggling to handle more than a dozen tracks at once. Logic will happily trundle along playing 64 tracks of compiled stuff, though SADiE is still my audio editor of choice. The Apple G5 also looks very attractive but both Mass and I are still wary of OS X. If a Mac running OS 9 goes wrong, we know where to look to fix it, but OS X is less of a known quantity. "All the final mixes are now done in Logic, feeding out via two MOTU 2408s and a 308, which means we have up to 72 possible outputs in one format or another. I still prefer to mix on an automated desk rather than in Logic as I find the approach quicker and more intuitive, though I've probably got a third of any one project submixed within the computer. We're still working with Logic 4.8 so any automation is done using Hyperdraw. We've been very reluctant to upgrade during an album project, but now we have a little breathing space so will make the jump to Logic 6, because as well as the much-improved automation, the Freeze function looks very useful. "We tend to lay off lots of different mixes — every permutation you can think of, so that we keep our options open. These are stored on SADiE as 24-bit, in-sync clips ranging from entire mixes to tiny edit options, from which we assemble the final audio that gets taken to the mastering session. Hopefully this lets us construct what we want after living with the mixes for a while. It's only then that the need for any further edits or modifications becomes obvious." Afro Celts have a history of drawing big-name singers and guest instrumentalists into their album projects, and these have included Robert Plant, Peter Gabriel, Sinead O'Connor, Jah Wobble and Ronan Browne, though the guest singer aspect has been played down somewhat on Seed. "Sometimes, if the guest musicians can't come to us, or if they need to update a part due to an arrangement change, those who like to work that way send us audio files, as did Martin Hayes, following an initial session he did over here on 'Ayub's Song/As You Were'," explains Martin. "At other times one of the Afro Celt producers will go to Ireland, or France or wherever and record the material, as we did to get Eileen Eivers' fiddle part for the track 'Rise/Rise Above It', which was recorded using close miking plus a pair of room mics simultaneously. The same track has Ms Dynamite's backing vocalists contrasting with the texture of N'Faly's voices and then taking over towards the end of the song. When Peter Gabriel sang on 'Falling', on our third album, 'Further In Time', he recorded his part down at Real World with Stephen Hague. Everyone has their own preferred way of working and we want them to feel comfortable." With so many different ethnic instruments to record, Martin has encountered some unusual miking challenges. "While we are very lucky to be recording all sorts of instruments that other people don't usually get the chance to work with, the main aim is always to switch into Record as early as possible so that you can catch the emerging idea. In our early days when I wasn't so familiar with the instruments, there were probably some trade-offs in the sound for the sake of content or performance, but the next time you do it you do it better. We have some great performers, but they don't want to sit there for half an hour while you get a sound — the idea will have gone. "When I first recorded the kora, I hadn't got a clue as to the best way to do it. You go by the seat-of-the pants instinct and the first thing is that as it is a very quiet instrument, you need to get in close, and that means the player needs to wear a pair of well-sealed, enclosed headphones, to avoid spill. I gave up recording it in stereo, which at the start is a temptation because the strings are evenly divided across a bridge which is two or three inches wide — unfortunately the musical artifacts of this approach proved too jarring, particularly as we were dealing with 'tickover parts' that were trancy and hypnotic. There was never a sense of where the player actually was in the picture. Also, if the guy is breathing heavily, that can be a problem. 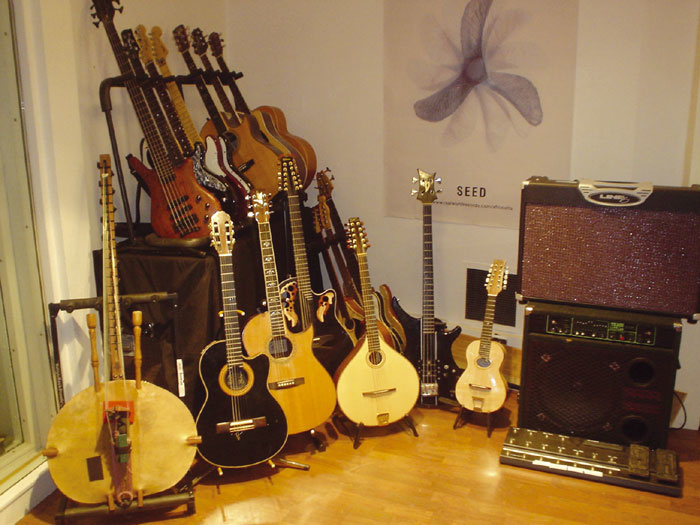 Stringed instruments Western and ethnic, including the African kora (front, left). "My first encounter with recording pipes was working with Davy Spillane, and I was very lucky, because when I went into the booth he'd already put the mic where he wanted it. He knew the relationship between the mic position and the sound — which notes shoot out around the back and all that kind of thing. I learnt a lot from those sessions." "The way Martin records the instruments is fantastic," adds James. "For example, I'd never heard such a range of sounds coming from the bodhran — which is, after all, a simple, single-headed drum. We got particularly spectacular results when we hired in one of those big Sony mics — the one with the cooling fins on the side. I'd never heard such depth of tone and extended bottom end from the bodhran before. It was like an 808 bottom end. That instrument became the beast it had never been before on any recording and it allowed me to play it in a different way. It taught me a lot. So often it's just a case of put the mic up and let's go, but whether or not you play well depends very much on the sound you're getting back, so you have to have the right equipment. The bodhran has to be played to make it sit in with other instruments, but it has a very wide frequency range, and when played with brushes, it can go right up into the hi-hat and shaker range. "Iarla, our vocalist from Ireland, is another satellite part of the co-production and writing team. 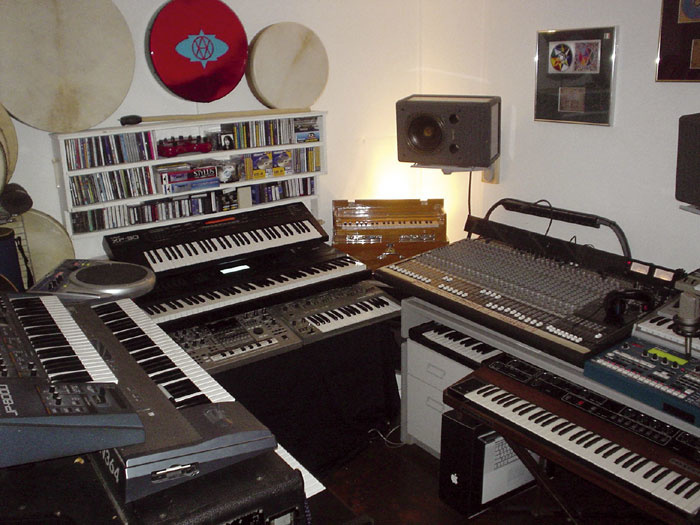 In his home studio in Thomastown, County Kilkenny, he has a Pro Tools HD system with Pro Control, Brauner mics, high-end Korg, Manley, Millenium stuff, Mackie monitors, everything. Historically it has been him who has come up with master takes very early on, particularly with his Gaelic tracks. When he comes in to record, he gives you those moments of magic very quickly so you just have to have the tape running." Apple Mac G4 running Emagic Logic 4.8. Custom analogue and digital patchbays. Emagic Unitor 8 MIDI interface. PC running SADiE v3 via X-S and X-ACT cards. Quested 5.1 system comprising 5x VS2205 and 2x VS1112. Sony DMX R100 mixer with 3x ADAT interfaces and assignable insert card. Drawmer M500 dynamic processor & DS201 gates. Ursa Major Space Station and Stargate reverbs. Crumar Bit 01 analogue synth. Akai S3000XL, S1000 and S1000PB samplers and VX90 synth. JL Cooper MSB1620 MIDI patchbay. Korg Z1, M1R and DW8000 synths and sound modules. Moog Taurus 2 bass pedals. Roland D50, D550, MKS10 and D110 synths and sound modules. Emu B3 and Xtreme Lead sound modules. Korg T1, N364, Wavestation AD and Microkorg synths, Electribe EMX1 desktop workstation. Kurzweil K2500S workstation and Micropiano piano module. Novation DrumStation and BassStation sound modules. Paolo Soprani / Alodi accordians. Roland XV88, JP8000, XP30, D50, Alpha Juno 2 and SH101 synths, MKS50 sound module, PK1 MIDI bass pedals. 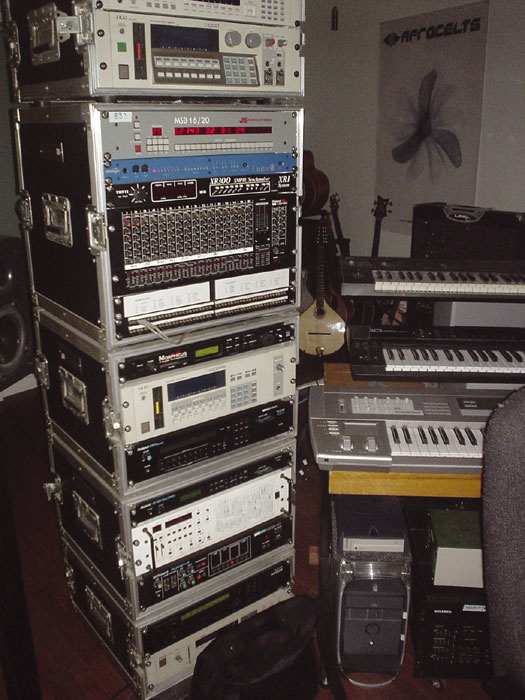 Roland MC505 sequencer, Handsonic drum controller, VP9000 Variphrase processor, S330 sampler. Sequential Prophet 5 and Prophet T8 analogue synths. Yamaha CP70 electric piano, RM1X and QY20 sequencers, SU10 sampler, TX81Z FM module. Apple Mac 9600 with G4 upgrade. Apple 15-inch and 17-inch Powerbook laptops. Digidesign Mix Plus system with 888/24 interface. 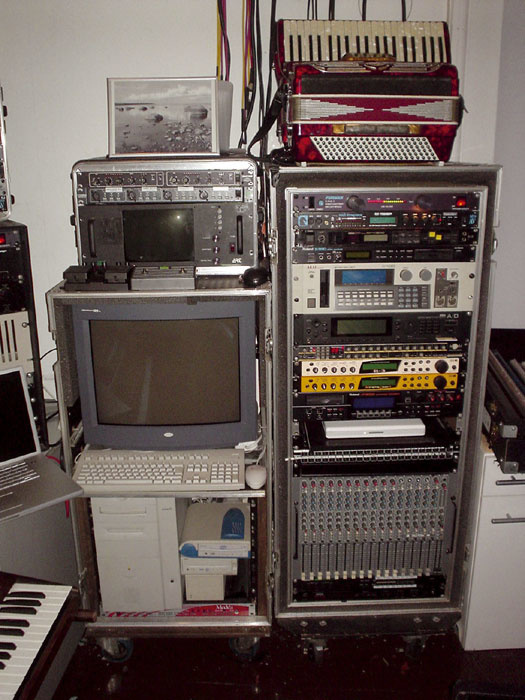 James's outboard rack.MOTU 828 MkII Firewire audio interface and MIDI Timepiece MIDI interface (x2). 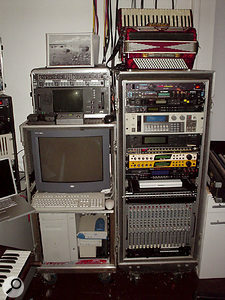 Software including Emagic Logic 4.5 and Sound Diver, NI Absynth and Reaktor, Propellerhead Recycle and Rebirth, Spectrasonics Atmosphere and Stylus. Lexicon PCM90 and MPX100 reverbs. Line 6 Pod XT amp simulator. TC Electronic Fireworx effects and D*Two delay. 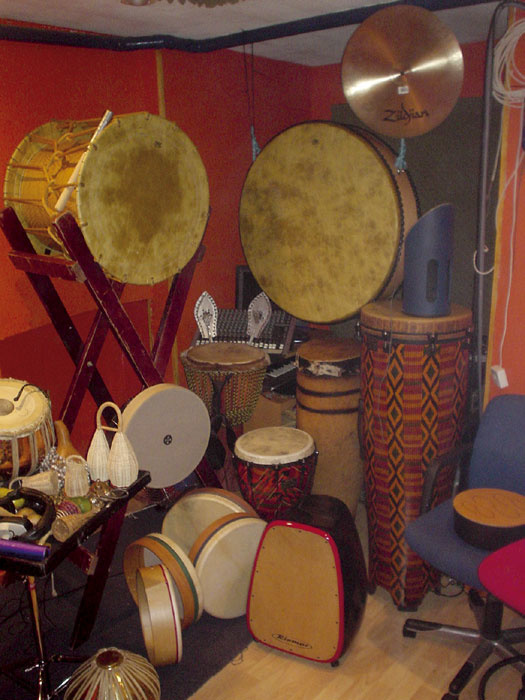 James's world instrument collection includes 21 single and double-skin tuneable bodhrans, from 10 to 33 inches diameter, Okeido Daiko kodo drums, standing N'goma drum, djembe, spring drums, 42 whistles in keys ranging from low G to high F, Colombian Gaita, Balinese bamboo and Southern Indian flutes, kalimba (African thumb piano), balophon (African xylophone), Cinkuvu (Angolan 'talking' drum). Apple Mac G4 desktop & Titanium G4 laptop. Creamware Pulsar 2 DSP card. MOTU 828 Firewire audio interface. TL Audio M2 valve mixer (used as eight channel strips), EQ1 and 2011 valve EQ & preamps ("the EQ1 was the first stage to anything I recorded on Seed"), 3013 EQ & preamps. Universal Audio UAD1 DSP card. Dbx 1066 compressor and 120XP bass enhancer. Joemeek SC2 compressor ("originally my kit overhead compressor, but it makes acoustic guitars rock"). SPL Transient Designer and Vitalizer ("as a high-frequency EQ boost replacement on individual instruments in a mix it's still great"). TC Electronic Fireworx effects ("mind-bending semi-modular filters and effects — don't leave home without it!") and M2000 reverb. Access Virus virtual analogue synth. Emu Morpheus synth module and E6400 sampler. Korg Prophecy virtual analogue synth ("My oldest friend... it's always in there somewhere"). Waldorf Pulse analogue bass synth. 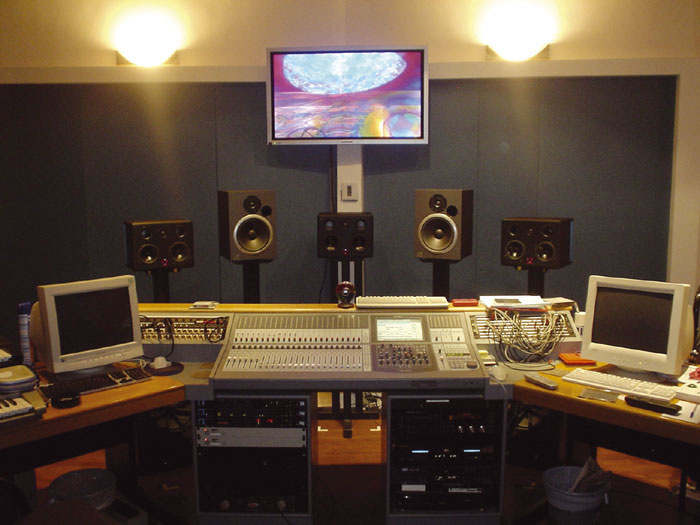 Over the last few years, the Afro Celts' studio has evolved from a mixed analogue and digital format to an almost entirely digital environment. 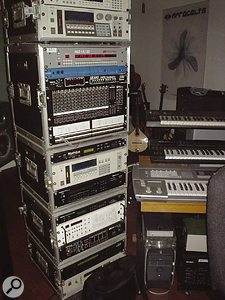 This has obvious practical advantages, but as Martin explains, the band have had to reincorporate some analogue technology for sonic reasons: "On the latest album project, we did some test mixes that were almost entirely digital throughout and then took them down to Metropolis to see what they sounded like. It was a bit of a rude awakening, so we thought we'd better get some warmth into them somehow, so Mass got a little TL Audio valve mixer (the original one that's got about 18 valves in it as opposed to just one valve per channel). Initially it was just intended for drums, but it sounds so good that now everybody wants to go through it. "As a musician with a background in industrial-strength rock, breakbeat and Psytrance, I have always made heavy use of technology to create, but from an engineering perspective, prior to working with these guys, I was almost exclusively producing guitar-type bands. That meant working a lot with analogue to maintain 'that sound'. I've definitely embraced digital and from a creative standpoint there's no going back, but as time's gone on I've found myself buying more outboard 'plug-ins' again! With the current standard of converters, I'm less worried about going back into the outside world and often find, especially with the acoustic instruments, that I can get what I'm after more quickly using hardware processing. The only affordable software product I've come across that has started to change my mind is the UAD1 PCI card system from Universal Audio. 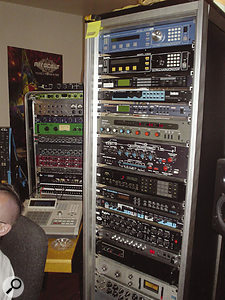 In the studio we have some original UREI and Summit (Pultec clone) outboard, and the UAD emulations come very close. In fact, to my ears, the UREI plug-in is better as the top end doesn't seem to close down as much when you really lay into it." Likewise, James is not one to change gear just to be up-to-date. In fact looking at his work area, it seems like he's kept just about every synth he's ever bought! "I like to stick with something that works, which is why I still have my Mac 9600!" he explains. "I also have a 17-inch Apple Titanium Powerbook, though, and I'd like to use that for more mobile work. I want to get out there — trying to coax artists to come to London is quite hard — they tend to prefer their own spaces, and that's where you're going to capture the best performances. "I have so many keyboards and rhythm boxes now, but each one has played its part. I love Roland gear — I've used a lot of it down the years combining them with some old analogue stuff. I'm not a great fan of the workstation-type synth even though I have a few of them. In each keyboard, like with all technology, I look for what it does best and try to find the brilliant sounds or control aspects that you can manipulate to find your own personality and expression. Keeping all these is expensive, I know, but if it helps you write even one song it's worth it. Next thing I want is a Hartmann Neuron — though I know the software isn't all it might be yet. Somehow you can accept pieces of software undergoing revisions and updates, but when you buy hardware, it's reasonable to expect it to work properly, even if it is software-based. I like all the Virus stuff too. I use the Indigo both in the studio and live, and along with the Neuron it should play a part on album five. "I bought a Korg Microkorg to see if it would be useful while working on the recent remix album and it proved a terrific little performer. I got great mileage out of the vocoder and the sounds were very strong. Now I'm looking forward to getting into the new Korg valve Electribe series. Then again, it's often great therapy to just turn everything off and play some acoustic piano or pick up a guitar and play some chords. That's sort of a mental reset button for me." The band have had considerable success with having their music used in films and TV, most recently in Gangs Of New York where Martin Scorcese asked them to remix one of their tracks to remove the guitar and substitute instrumentation more in keeping with the period of the film. This interest in using their music for films, and the presence of a Quested surround monitoring system (set up alongside a pair of Event BAS 2020s) prompted me to ask whether they had done much experimenting with surround mixing. "Our first project once the studio was functioning was supposed to have been a DVD of the Womad concert we played in Seattle a couple of years back, the idea being that we'd also add a few studio tracks mixed in surround," says Martin. "As it turned out, the live sound recorded on the night wasn't useable. It wasn't done on a mobile, just on the high-definition cameras that were used to shoot the event. There were hums, buzzes, distortions and drop-out across all of the tracks and some really dodgy submixes of key elements. Since we didn't want to fake it back in the studio, the project was abandoned. "After that it was straight into working on the Seed album. My initial intention was that we'd mix in all formats, because even if we weren't releasing in surround now, it would be needed at some time — but this soon went out of the window! Because of the pressures of time we were only able to do stereo mixes, though we will remix the entire back catalogue in 5.1 at some point. "As we're about to embark upon album five, I'd like to get into some surround recording, not just mixing. It would mean going to a large space with plenty to offer acoustically so we have some unique elements that people haven't heard in the stereo version. SACD is starting to interest me, too. I've been checking out the latest version of SADiE, which can handle all the aspects of this. Afro Celt music is totally designed for 5.1." Seed was the first album that Afro Celts recorded in their own studio, and I was interested to know how the band felt it compared to their previous studio albums. "We had a very high quality barrier to break because the previous three albums were mainly mixed at Metropolis and Real World, yet we feel the last album is the most accomplished-sounding," enthuses James. "Mass's drum and keyboard programming has given us a whole new lease of life, and our material was changing to such an extent that bass guitar rather than synth bass was going to be more appropriate on several songs. Furthermore, in addition to our usual percussive arsenal, some tracks were crying out for full drum kit. Mass programmed passages of 'live kit' playing that were so mesmeric that on one track, 'Deep Channel', drummers were asking who'd playing it. "The whole bottom end thing has worked better for us this time," adds Martin, "but it wasn't a conscious decision — the music just headed in that direction." "That's what was great about working on the last album with these guys," agrees Mass. "Instead of just continuing with our previous methods and ending up with a formulaic sound, our writing methods gradually mutated, and what had seemed like an 'A' track at the beginning of the process suddenly didn't feel like it belonged on the album any more. One of the greatest challenges with editing is often having to condense minutes of expression into the final structure, keeping the natural ebb and flow but always focused in relationship to the big picture." "Seed was like a coming of age," concludes James, "and the other albums almost felt like an apprenticeship. We're always adapting by using new instruments and new musical traditions. We seem to have broken the boundaries — musically we can now go anywhere in the world, maybe Chinese instruments, Chinese performers, I'd love to work with some of them as they have individual ideas, but in terms of our studio work, I think Seed is the beginning of something we've really got cooking now — we can say, we've done that, now let's see what we can do next."